Click on the image of the map to open the free PDF document! The download of the free PDF document can be done by a click on the right mouse button (at touch displays long press). Then select -Save Target / Link ...- and straight away the tube map should be downloaded on your tablet, PC or smartphone. 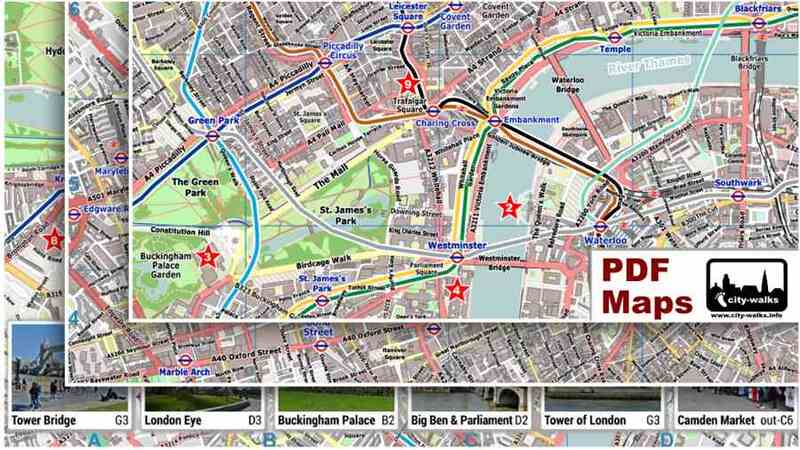 The map is created in A3 format and therefore also perfect suitable for a printout on the A3 page size. There is also a 2-page version available for A4 printer. Please click the button below to open the A4 version. 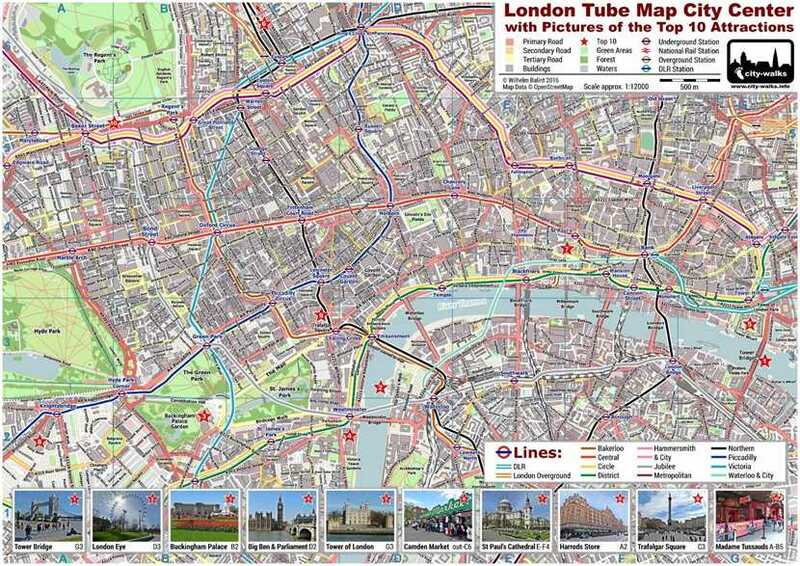 The new London tube map from city-walks is a PDF street map with the underground network and the top 10 attractions for tourists in the central zone 1. The sights are marked in the map with red stars and each one is represented by a picture with caption. Due to that you will be able to find quick and easy the nearest tube station to the London attractions in the center of the city. On the map you will not only find the stations but also the underground lines, which are color coded for your convenience. This new kind of design makes the route planning very simple. To print the 1-page version shown above, you should have the possibility to do A3 page printing. If you use a smaller format with this version you will have troubles concerning the readability of the street map. The 2-page version of the London PDF map, which is available at the button below, is formatted for a readable printout on A4 pages.